AMHERST, N.Y. – Daemen College recognized outstanding student leaders in clubs, organizations, and departments at the college’s annual Student Leadership Awards luncheon held on May 3. 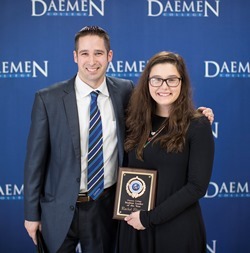 Daemen’s 2018 Chris Malik Student Leader of the Year Award was presented to Rachel Shapiro of Tonawanda. The award, renamed this year in honor of the college’s long-time director of student activities, recognizes a student who has exhibited extraordinary efforts and achievements in student life at the college. The event, which was hosted by the Office of Student Affairs, also included Daemen’s fourth annual gavel ceremony to officially transfer responsibilities from the outgoing to the newly elected president of the Daemen Student Association. Alexandrea Artise of North East, Pa.
Krishanti Trivedi of Monmouth Junction, N.J.
For the gavel ceremony, outgoing president Hugo Juarez of Ridgewood, passed the gavel to Mikayla Otero of Newark, who has been elected to serve as the 2018-19 Student Association president. Other newly elected officers for the Student Association Executive Board are Ricardo Marquez of Los Angeles, vice president; Telena Smith of Brooklyn, treasurer; and Tori Newman Campbell of Brooklyn, secretary.